Tag Archive | "St. Louis Marathon"
The inaugural Rock ‘n’ Roll St. Louis Marathon & 1/2 Marathon took place over the weekend on October 23, 2011 in St. Louis, Missouri. Both the full and half finisher’s medals were similar except for the color of the ring circling around the medal. The full was red (Cardinals red) and the half was navy. 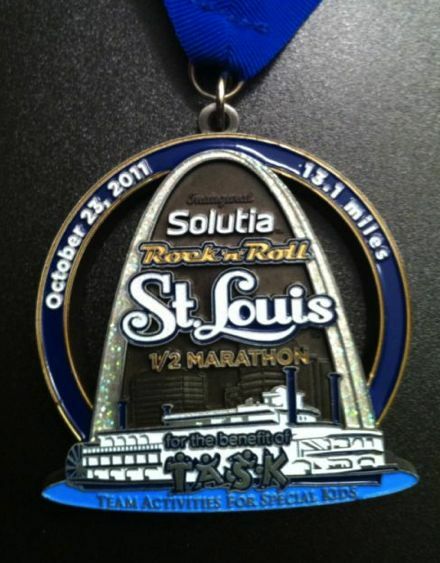 Overall, I think it’s a very pretty medal that focuses on St. Louis’ most historic landmark, the Gateway Arch, with a riverboat at the base of it. 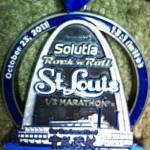 [Stl full medal photo submitted by David D. Follow him on Twitter @bigcat48. 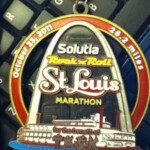 Stl half medal photos submitted by Lauren Stone (@laurens3386) and Kevin Kozuszek (@kkozuszek). 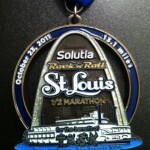 Indianapolis native Cory Ferguson won the inaugural Rock ‘n’ Roll St. Louis Marathon on Sunday with a time of 2:29:21. He didn’t win by much though as Illinois’ Arturs Bareikis was just 2 seconds behind at 2:29:23. Congrats to all of the 3,354 finisher of the full marathon and the 14,511 finishers of the half marathon as well. The half marathon was won by Josphat Boit with a time of 1:08:27. The female half winner was Amanda Dunne with a time of 1:20:08.